eZee FrontDesk is an extremely powerful Hotel Property Management System that combines extraordinary features with extreme ease of use and flexibility, making it a PMS solution that is hard to ignore. Though it is feature rich to a fault, it does not burn a hole in your pocket. It carries a surprisingly non-premium price tag. eZee FrontDesk comes with unbeatable 24x7 technical and other support from both MATEL and eZee. With more than 6,000 successful installations in properties spread across 140 countries worldwide, eZee FrontDesk has been widely recognized as a software that meets the requirements of even the most demanding of international properties. eZee FrontDesk supports a number of international as well as regional languages. With so many features and USPs, it is no wonder that eZee FrontDesk is today the fastest growing PMS and the preferred hotel management suite for a number of big name properties from around the world. eZee Absolute, Web based Property Management System is the newest invention by eZee Technosys Pvt. Ltd. who created their worldwide existence as a leading Hospitality IT Solutions provider with round the clock Support. Online Hotel Management System has been developed based on SaaS (Software as a Service) Technology for small properties, hotels, motels, resorts, clubs, B & B\'s, small hotel franchisees, clubs, condo\'s, hostel and apartments to multiple Hotel Chains industries to present them with the web based system through the Pay per use concept. eZee Absolute is also called as online PMS, Saas and cloud model eZee Hospitality Solutions has been used in more then 86 countries round the globe by having 38 International support centers. eZee Absolute is covering all major component of Hotel requirements starting from online Booking, check in – check out, House keeping, Mini bar, Banquet, Maintenance, Payroll and many other functionalists. Further more, eZee Absolute is having various kinds of third part software and hardware solutions like, Financial Accounting System, Key card lock interfaces, credit card processing and call accounting system. To fulfill the needs of all hotel owners and their staff to make their task easy, eZee Absolute has come up with more then 700 reports from software to get each and every record with different kind of information stored in web based hotel software. Burrp is a stand-alone restaurant management system that is among the most advanced POS System currently available for restaurants, bars, night clubs, quick service restaurants, delivery joints, and other operations. As points-of-sale, each of these outlets require a software solution that is not just fast, but also delivers high profitability for every feature; eZee Burrp does all of this and more. Whether the need is to manage one loyalty program or many, keep table reservations up-to-date, manage the materials available to your chefs, or keep orders on track, eZee Burrp is always up to the task. 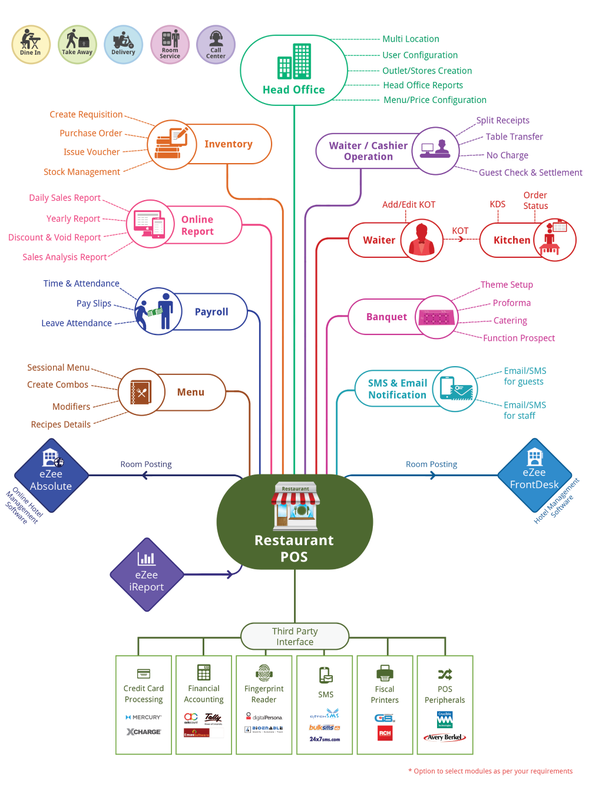 Restaurant POS System has been designed to integrate the various tasks of managing your food establishment into a single interface and make it easy for you to enhance the overall performance of your joint in terms of efficiency and profitability. At the same time, it is supremely flexible, gets updated regularly, and comes with top-notch, 24x7 technical support. eZee Burrp is fully compatible and can easily be integrated with eZee FrontDesk for ease of operations. It also offers complete PDA support and has a web interface that allows remote monitoring, reporting, and restaurant management. The best part about eZee Burrp though it that it costs very little to acquire and integrate. You do not have to give any specialized training to your staff or bring in any additional hardware. You can be up and running in just a few hours and that too without stopping operations or even disrupting the regular flow of business! User-friendly interface offers a smooth navigation of the digital restaurant menu and ordering blazing fast. It will improve the customer service, efficiency and increase your revenue generation capability of the business. Restaurant can choose from three work modes in the Digital Menu Software which suits their operational style. The three work modes include View Only Mode, Guest Mode and Waiter mode. The robust features such as theme customization, item modifiers, POS integration, guest feedback and much more, gives restaurants all the tools required for easy management and increase efficiency. Appytect is a Mobile Application Builder for Hotels. It will allow you to build dedicated App for your hotel which then cab be published on Google Play Store and Apple App Store. In today's digital age, everyone owns a smart phone and has access to the internet. To reach out to maximum number of people, a dedicated app for your hotel can help you reach out to wider audience worldwide. Powered by robust customization options that will enable you to highlight hotel's brand and provide convenience for direct bookings and sharing hotel information to your guests. Hotel's can directly reach out to the guests by providing them information on hotel's location, upcoming events, local attractions, etc. Hotel Mobile App can significantly increase hotel revenues by offering special offers to their guests and promotions during high seasons. Guests can keep track of your hotel with regular updates like new facilities at the hotel and directly book from the App with built in mobile booking engine. In addition, App can be customized according to ever changing requirements of the hotel. Hotels can add and edit features in the App anytime without any hassle. eZee specializes in developing and providing hospitality IT solutions and one of the only few who provide complete set of solutions. Solutions from eZee are seamlessly integrated making them easier to implement without disrupting the business environment. MyKAd is the National Identity card issued by the Malaysian Government to all Malaysian citizens and Permanent residence in the country. Majority of the businesses are required to have MyKad ID Reader Devices for identification and it is one of the most important hardware requirements in the hospitality. eZee Malaysia has the experience and will guide you in choosing the best hardware solution for your business. ID Scan Passport Scanner is another essential piece of hardware for hospitality business. With more tourists coming in Malaysia from all across the world, this hardware will scan and store images of any passport and store the data in your database. eZee will assess your business requirement and offer the best ID Scan Passport Scanner. eZee Malaysia carries years of experience when it comes to hardware solutions for hospitality industry and every business is unique and so are the requirements. Given the diverse nature, we will select the best and the most cost effective hardware solution, which includes desktop hardware, monitors, servers, etc. eZee will guide you in setting up the most productive hardware model matching your requirements and help you achieve new level of efficiency. One of the most important trends in recent years for the hospitality businesses, the touch based POS terminals are one of the most cost effective and time saving hardware for the industry. With eZee products compatible with majority of the POS terminals in the industry, we can provide the right guidance in choosing the best hardware solution for your business when it comes to POS Terminals. Hand Held PDA devices are one of the most highly and widely used hardware in the hospitality sector. Widely used in restaurants, bars, nightclubs, pubs, etc. they are ideal choice for fast-paced environments to increase the operational efficiency and deliver customers the best service. eZee software is fully compatible with all touch based hand held PDA devices. Finger Printer Readers are mainly used in POS software for keeping up with the time and attendance of the staff. eZee products are compatible with the majority of the finger print readers in the market and provide the best recommendation depending on your property.